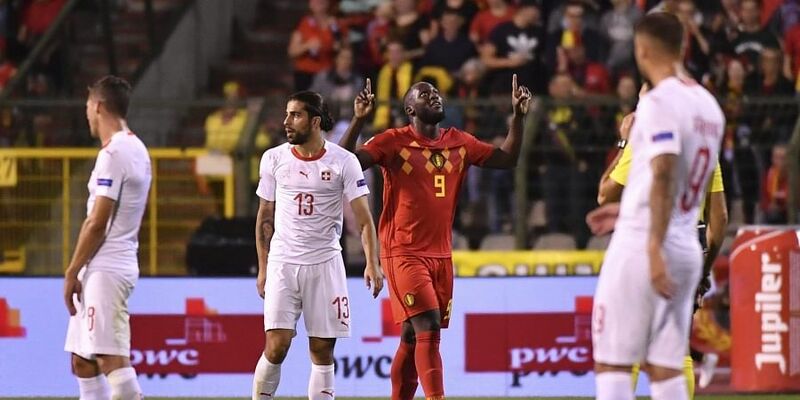 BRUSSELS: Manchester United striker Romelu Lukaku struck twice as Belgium maintained their strong start to the Nations League with a battling 2-1 win over Switzerland on Friday. When Lukaku found the net with an angled drive on 58 minutes, it looked like Roberto Martinez's men would be giving French World Cup winner Thierry Henry a winning send-off in his final match as Belgium assistant coach ahead of an imminent move to Monaco. A Shaqiri effort on two minutes was no trouble for Courtois but Belgium threatend a minute later when Youri Tielemans completed a slick one-two to drive a rasping low shot inches wide of Yann Sommer's left upright. Yannick Carrasco's header was off-target and then Eden Hazard was allowed to cut in from the left to set up Carrasco for a decent swipe at goal that inched just wide on 25 minutes. Lukaku showed power and agility to hold off his markers, pivot and complete a one-two with Axel Witsel before testing Sommer's reflexes via a deflection off Fabian Shar's leg. On 58 minutes Lukaku finally beat Sommer, from the right of the area after an assist from Paris Saint-Germain midfielder Meunier. From a quickly-take Hazard corner, Mertens' curling drive was spot on but pushed to safety by Sommer at the far post just after the hour. Minutes later Arsenal's Granit Xhaka fired just wide of Courtois's post. Barcelona defender Thomas Vermeulen hobbled off to be replaced by Derdryck Boyata on 73 minutes. Minutes later, the Belgian defence were nowhere when Gavranovic poked past the stranded Courtois for a 76th minute leveller. Swiss hopes of a draw crashed when series of passes found Lukaku in space in the area and the big United striker bundled an awkward ball past the splayed Sommer for an 85th minute winner.